There has been a lot of talk about the super-cycle in commodities but it is important to breakdown the source of the gains in prices. Commodities have been range-bound for the last few years when you look at an index but there is a lot more going on when you break-up the performance by sectors. The big rally in commodities has really been driven by the precious metals markets. They were a dominant driver pre-Great Recession but were certainly the key driver in the post-Recession, new QE period. This return increase was driven by flows into ETF's and other financial products that made gold more accessible to retail customers than before. That movement into gold and a lesser extent silver has stalled but the rise of gold relative to other commodities is still a important story in the commodity markets. The gold story is an anti-inflation story. It is a story against weak currencies and a story against excessive debt, and it is a story that has played out at this time. We have not had the large crisis in the EU which some expected. Inflation has been under control at this time and financial assets have done well. The gold move is not about supply shortages but demand driven by substitution from other assets. The second large commodity theme has been the strong move in the base metals which is driven by the demand from China and its infrastructure and real estate development. There has been an investment lead rally in China which created strong demand for copper, iron, lead, zinc, and other base metals. With the slowdown in China and the shift to consumerism, prices have been on the way down. Investment in mining from a few years ago has led to new supply so there is a natural mean reversion in this sector. The energy sector has seen increases in oil prices related to geopolitical risk and demand from emerging markets, but that has cooled with a reduction in tensions and slower global growth. The great increases in natural gas has created a new market structure in the US. Agriculture markets have had similar returns as the index but with more volatility given supply shocks. Agriculture markets see more mean reversion and offer more trading opportunities given seasonal factors. This may be the place of greatest potential opportunties in the short-run. It is surprising that markets have not shown further reaction to the the Cyprus problem of convertibility. This is an issue that will touch all markets around the world. If there is an increased probability that governments will not allow convertibility, there will be less desire to hold any currency outside of your home or if you believe there will be a convertibility problem with your home currency, there will be a desire to hold another store of value such as the dollar. If the single currency Euro has a convertibility problem what about other currencies from countries that are "less developed". The Cyprus restriction means that all euros are not the same. Your Italy euros may not be the same as a French or German Euros. The EU governments with the ECB now states that it has the power to make changes in the system with little regard for the Euroholders. Of course, there has to be restrictions on the Cyprus banks or there will be a flood of money out of the country, but is there a better way to handle the problem. The dollar rally is a result of the convertibility issue. There is a belief that the dollar will not be restricted. Nevertheless, I want to hold deposits in Banco de Mattress. Could using reserve requirements be an answer? Jeremy Stein wrote an interesting FT editorial on reserve requirements as a win-win solution to solving the large Fed balance sheet from QE purchases. It is an interesting proposal and could be a simple way out from selling all of their Treasury holding. You may remember reserve requirements. It is the central bank policy that every economic student is taught in their intro course on banking. Fractional banking is how money will be expanded in an economy. Changing the reserve requirement will have a direct impact on the size of money in the economy. A reduction in the reserve requirement means that banks can issue more new demand deposits. An increase in reserve requirements will cause shrinking of the money supply. Of course, the Fed does not use reserve requirements anymore to make their monetary decisions. It has been viewed as too blunt an instrument relative to change rates. But, we do not change rates anymore because we are in a zero rate environment. We have moved to QE, so reserve requirements may not be so blunt a policy tool as before. Stein believes that this could be a simple way to solve the current banking problem of the large balance sheet. Go back to old school monetary policy. Right now there is a significant amount of excess reserves held at banks. These can be reduced through increasing the reserve requirement while still offering interest payments to the banks. An increase in reserve requirements will rescue the amount of money that can circulate in the economy. It would be the same as selling some of its balance sheet. Problem one of excess money can be solved. Problem two for banks is that they need to have more capital. Reserve requirements may serve as a substitute for bank capital. It is a ready source of funds that can meet the needs of banks instead of Basel III requirements. It si a nice bank cushion. Reserve requirement adjustments are a win-win for bank capital management and for fed policy. Trade deals to the rescue? Talks on trade deals are now occurring and this is good for the global markets. There is the fear that a slow growth global economy will lead to trade wars.If there are talks of regional or bilateral trade, countries may be able to avert any major trade battle. The US is in bilateral talks with the EU and the EU is in talks with Japan to open up markets. In the case of Japan, the issue is not import restrictions but the regulations and standards used in Japan, The setting of standards can serve as a trade barrier. There are also talks between the US and Japan through the TPP Trans-Pacific Partnership. The TPP talks have been stalled based on cross border fiance restrictions, but it seems like there is a desire to get some things done. Trade needs to enhanced and if a global trade deal cannot be made regional or bilateral deals are a start in the right direction. There have been a number of long-term dollar swings since the beginning of floating exchange rates and we are currently in another potential transition point for a dollar rally. Commodities have done poorly during periods of dollar appreciation and have done well during periods when the dollar has been in decline. A simple explanation is that since most commodities are priced in dollars, there will be a drag on commodity demand when there is a dollar appreciation. '01-'11 was the period of the super cycle. The period of dollar ascent matched poor emerging markets and falling commodity prices. The early 80's was the period of Latin American crises. The '92-'01 was a period of the Mexican and Asian crisis. Avoid commodities during a dollar appreciation and crisis period. These problems have been discussed by many other authors and are well-know to almost anyone who studies decision theory. The Heath brothers try to solve the problems though a useful set of hints through what they call the WRAP method. There is not a lot new here but I think I can get used to employing the WRAP method as a simple devise to help with any decision. Have I WRAPped it up? Or as said in filming, "It's a WRAP!" This could a simple way of looking at complex finance problems. How do investment ideas form a contagion? Jonah Bergers has writtena new book called Contagious: Why Things Catch On which I am currently reading. I am trating to filter his views throuhg the lens of finance and investing. Why do ideas catch-on in finance? Themes or mems seems to develop in finance. They are usually based on some simple facts but start to take on a broader life. The current rally and talk about a great rotation is a case in point. There are some posiitve numbers but there is also a story for why the market should head lower. The positive story seems to have had a more contagious impact on investors. Is this a CNBC effect? all create the opportunity for a contagious result. Investing media seems to be a likely place for STEPPS to take hold. I am surprised we have not studied this more. Many have cheered the new BOJ and their movement to increase inflation. The yen is down and the Nikkei is up. How can we question the wisdom of current policy. However, Japan still has to define the role of the central bank. Monetary policy is not the solution for structural flows. How are those going to be solved? BOJ head Kuroda is now being thought of as the Paul Volcker of Japan. Paul Volcker stopped inflation through high rates and slower money growth. Kuroda will be the opposite of a an inflation fighter, the deflation slayer. Yet, like Volcker he is going to have to warn of the limits of monetary policy. Globalization is declining and we should be worried. Even with all of the changes in communication and all of the discussion concerning the world being flat, the world is moving back in time with respect to financial flows. International trade also has declined and is growing at a slower pace since the Great Recession, but finance is still a more important segment to global markets. This decline in trade should not be surprising given the decline in global GDP, but more importantly, the decline in the growth of financial assets around the world will affect long-term global imbalances. Financial flows are what has been an oil that drives the trade engine. Financial flows are what will solve the great savings imbalances around the world. Flows are slowing and there are many who do not care. Financial assets were growing around the globe at a rate of around 8% and has been flat since the end of the Great Recession. There has been a 60% decrease in cross border capital flows since the peak in 2008. European banks have reduced their cross border flows by $3.7 trillion with $2.8 trillion being intra-Europe. Europeans do not want to lend to other Europeans outside of their country. This is even with the same currency! There is a movement to localized finance whereby debt and equity raising is done from local investors who are keeping money within their home country. There is also an increase in capital controls across the globe to stop hot money inflows and outflows. The major government institutions like the IMF have pushed to reduce hot money flows and have embraced the institutional school of capital flows which states that there is harm with how money is raised for project financing and current account deficits are financed. The decline in cross border flows is going to further negativelyimpact trade and is going to fragment the globe into regions and localized markets. New development will now be restricted to the desire of local bankers and politicians without the chance to receive funds based on the value of the project. Of course, this is the positive view to cross border flows. There is also the view that cross border flows are bad and this return or movement to localized financing will reduce the change for a financial crisis. I fall into the camp that reduced flows are negative for the globe and will casue more harm by not allowing savings to find the right home. There is a huge difference in the price of natural gas around the world. The price in Japan is three times higher than what you will find in the US. Prices in the EU are tied to oil and double of what you will find in the US. The natural gas supply gains are very localized and unlikely to change in the near-term. The development of shale gas has been a key driver for the decline in the US prices relative to the rest of the world; however, contract pricing for natural gas around the world has a big impact on overall demand. The pricing of natural gas is more complex than just saying the US is drilling more relative to the rest of the world. The pricing design mechanism for a commodity will have a large impact on the ultimate price of exchange. Market design matters with determining ultimate demand and supply within a market. If there is a an active spot market, there will be significant more price volatility. If there is a long-term contract market, prices will be less volatile and will adjust slowly to changes in supply. If the contract ties the prices to other energy sources, there will be a an average price per BTU of energy. If supply is determined by long-term contract, spot supply will not be able to come to the market and lower costs. While many often talk about competitive markets, in reality the desire for a competitive market may not be that strong. The energy company that invests in natural gas development would like to know with certainty that their investment will pay and would like to lock-in long-term prices. This makes project financing easy. Similarly, the demanders of energy would also like to lock-in prices to determine their energy input costs. Both parties would like longer-term pricing but with flexibility if there is a change in supply or demand. Contracting is not just on the price side. The suppliers would like to ensure that they can sell a fixed quantity and demanders would like to have certainty in quantity as well as price. Hence, there developed the take or pay contracts in the US. The key to contract markets will be the number of comepetitve players and the opportunity for new entrants in a market. if there are more players or entrants, there will be a greater demand for a spot market. These long-term pricing designs work well when there is little surprise in the market. If there are shocks, a spot market can serve as a safety valve for the market. In the US, given coal contracts are starting to roll-off, there ill be increased demand for gas. Switching will continue. Pricing in natural gas is on the rise because contracting behavior is changing market structure. Where is the commodity super cycle? 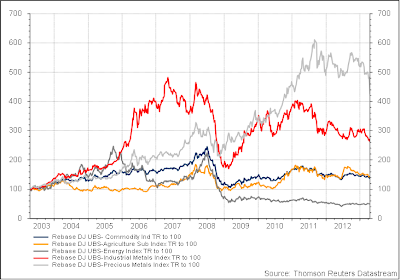 The major long-term theme in commodity markets for the last decade has been the commodity super-cycle. It has not disappeared, it has expired with the changes in economic growth around the global. The 2000-2008 period will be noted as a special global growth period with the ascent of emerging markets. This was the time where everyone was talking about the BRICs and the growth of the middle class in emerging markets. China grew at extraordinary rates and there was no global crisis for almost eight years. In commodity markets, under investment meant that supply could not keep up with demand. Prices moved above marginal cost and new investment began. Move forward post-crisis, trade fell off a cliff in 2009 only to rebound smartly along with global growth. We may not have seen as strong a growth cycle in the US but the rest of the world showed strong gains. However, these growth gains did not continue in 2011-12 and now global growth is less than the 2000-08 average. BRIC GDP is lower, global GDP is lower by at least a third, trade is about half the average, global confidence has fallen, and manufacturing is down. In fact, commodity prices seem to better represent the real economy than the global stock markets. Commodity markets which represent immediacy is showing weakness while forward looking markets like stocks is showing strength. The super-cycle is following the lack of super growth. There should be no surprise here. One of the key ways that equities can move higher is through increases in margins, but the problem is that margins are already high as seen by the charts from Zacks. Our guess is that margins will start to decline in-line with the higher cost of regulation and specialized labor. If that is true, earnings will come down. The momentum in stocks has been a margin story and not a revenue story. You can have a situation of declining margins yet more revenue but that seems less likely with the current macro environment. Is there a commodity rotation? Everyone has been talking about the Great Rotation into equities this year. With the recent stalling in prices, the fervor for this talk has declined, but there are other rotations within asset classes. In particular, there is a rotation in commodity behavior with the what seems like the end of the super cycle. During the commodity super cycle, prices were macro-driven by the movement in global growth.The surge in China growth pushed commodity prices higher but with the Great Recession, there has been flattening in commodity momentum. The market has moved from being macro-driven to one that is more localized. 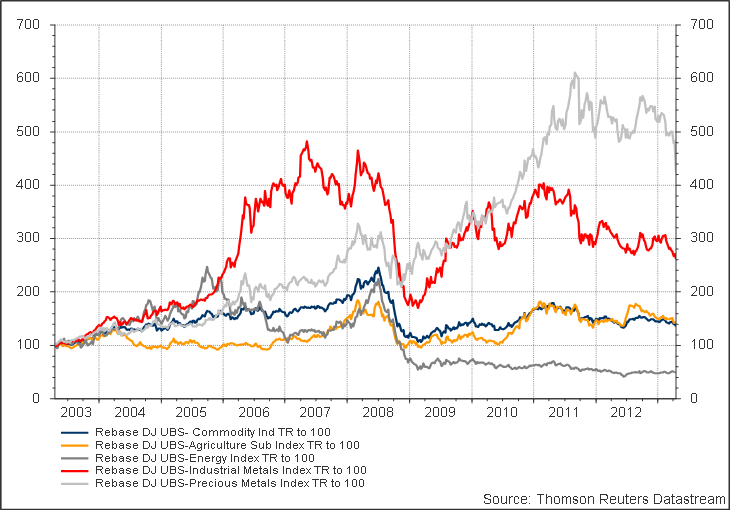 The cross correlations in commodities are at the lowest in years. The commodity rotation has moved to behavior that emphasizes commodity specific behavior. Additionally, the dampening of inflation expectations has reduced the demand for precious metals which has been a strong driver in commodities. The idea that commodities are needed as a hedge against the next round of inflation has fallen from favor which has placed more emphasis on those markets which have inventory shortages and not a desire to hold real assets. There is a growing divergence between developed market equities and commodities. The equity-commodity correlation has moved from above .8 to below .5. However, at the same time there has been a slight increase in correlation with emerging markets. The link between commodities and emerging markets is both on the supply and demand side of the equation. In the case of China, slower growth has reduced the demand for many base metals. A positive correlation between slower growth and declining prices. Similarly, the suppliers of raw materials to China such as Brazil have seen the impact on their exports. Brazil and other commodity suppliers have seen a growth decline. The result has been a common factor of growth affecting both markets and decoupling with those equity markets which are less raw material driven. We have learned that some of the results from the work of Reinhard and Rogoff on government deficits are wrong. They made some errors in their excel spreadsheet calculations. The negative impact on growth from high deficits is not as bad as what their original results show. There is no excuse for that mistake; however, the general results are still the same. As debt to gdp levels reach close to 90%, you are going to get a slowdown in growth. High debt is a drag on growth. The theory behind this is very sound. If the size of debt to gdp is greater than 100% and the nominal rates of interest are higher than nominal growth rates, all of the growth will have to be used for funding the debt. The result is a drag on growth because the money has to be used as a payment to debt holders. The extent of the drag is an empirical question. It should be noted that there are some large problems trying to measure these macroeconomic events. The data is limited. It is hard to work with. There are other factors going on, so it is difficult to tease out strong conclusions. There is plenty of room for disagreement on some the conclusions; however, the overall results still hold. Does this end the austerity school of debt management? No, there is still place for fiscal discipline however, we also need to look at whether fiscal spending has to be targeted to jump-start the economy. Keynesian counter-cycle policy is still important. The problem is not short-run policy but the structural deficits from health career and retirements which is the problem. We have to separate deficits based on capital spending in the short-run and structural changes in the longer-run. Still, the rising debt to GDP numbers is a clear headwind that will slow trend growth. G20 pledge - no competitve devaluations - oh really? The G20 is supposed affirm their commitment to not use competitive devaluations to help exporters. Did Japan miss the message? What about the US? What about the UK? While it may not be explicit, the QE rage is supposed to drive down the currency levels and help exporters. This i a natural part of easing monetary policy. I guess central banks are just not supposed to say anything about what is the intent of policy. There is a need for countries to not form a currency war through devaluations, but it is hard to enforce and hard to distinguish between active monetary policy. The intent is good, but it will be hard to enforce. 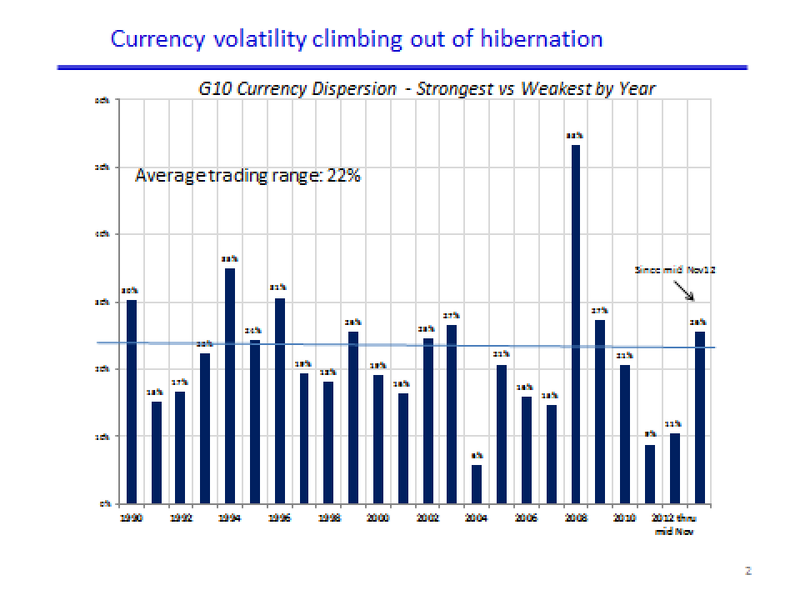 2013: The return to normal in FX markets? I was on a panel at FX Week North America. Here are my notes from my comments. a. 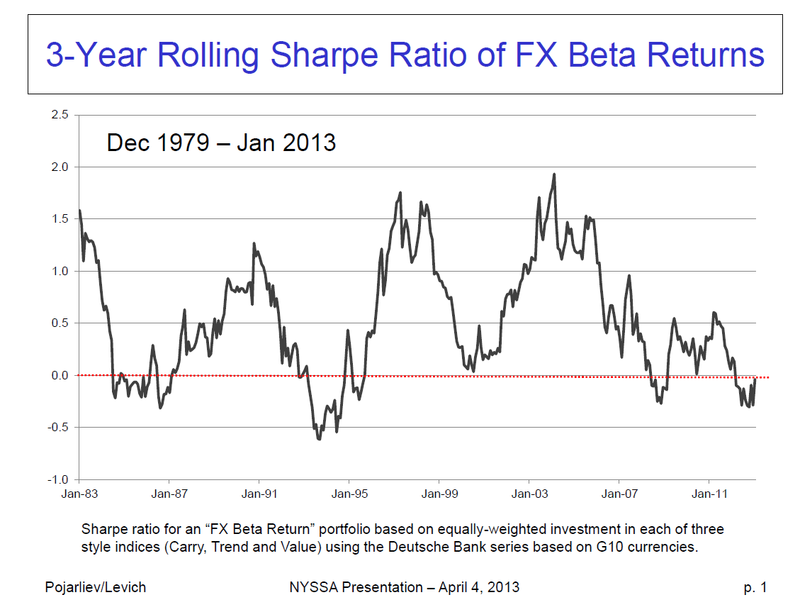 The Sharpe of FX style betas have shown a significant decline and just now returning to flat levels. b. Can normality of exchange markets explain Sharpe and currency dispersion? c. Where are we headed? i. In reality, the numbers are only suggestive; volatility has declined with less fundamental differences but the connection is not strong. IV. 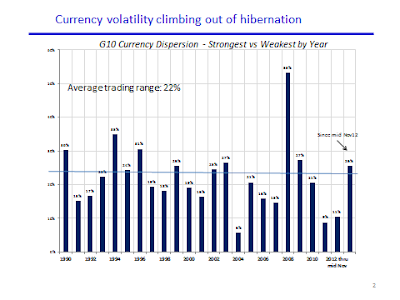 The mystery of currency volatility - excessively volatile? Risk parity has become the new thing for asset management. Do not allocate your risk by dollar allocations, but by the contribution to risk. A dollar allocation that is 60/40 between stocks and bonds is not the same as having a 60/40 risk allocation. Since stocks are riskier than bonds, the risk allocation is higher to equities than is the case for a dollar allocation. Under this type of model, there is the assumption that diversification is the only free lunch that still exists and risk management is more important than dollar exposure management. The simplest case is that you equalize the risk across asset classes and then lever to set the overall volatility target. JP Morgan will call this approach of looking at risk parity more uncertainty management. When there is more uncertainty on the parameters of return, volatility and correlation there is a reason to equalize risk exposures. Put another way, since we have so little faith in the expected returns determined historically and used for optimization, a better approach would be to equalize the returns and focus on risk or other aspects of asset allocation. A simple early version of this type of work is the results showing that 1/n allocation is not a bad way to solve error problems in expected return or volatility. If the Sharpe ratio for asset classes is closer, then there will be more advantage with holding the risk parity portfolio. This makes sense. It is worth differentiating asset classes if there is greater differentiation in the asset classes. In some sense the idea of holding a 60/40 stock-bond portfolio is one way to avoid the errors associated with return forecasting. Unfortunately, if you have a 60/40 portfolio you place the majority of your risk in equities which means that you are still dependent on stock return streams. The idea that you would look at risk as the determining allocation factors is a further refinement of avoiding traps based on return forecasts. There is too much error in forecasting returns so a good approach is to change the focus of analysis. 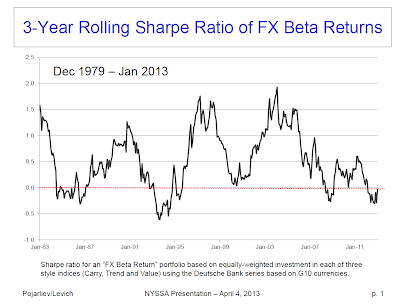 Assuming that Sharpe ratios are the same across asset classes in the long-run is not really a bad assumption. Equities could return more, but the return per unit of risk is the same across asset classes. Risk parity can be thought of as assuming that correlations are the same and Sharpe ratios are equalized; however, there can be further work to adjust these Sharp ratios and tilt the allocations of return to risk. If you move to differences in Sharpe as opposed to equal Sharpe ratios, some would argue that this is more akin to risk budgeting as opposed risk parity. Risk parity would be a special case of risk budgeting. Looking at differences in Sharpe is the same as looking at differences or accounting for differences in risk premia. Implementing risk parity is harder than what you may think. One of the issues is that the distribution of returns is not normal so hat using some simple meansure like volatility alone may cause a manager to choose more risk than he would like. Still, risk parity is an important addition to any discussion on risk management.